There’s no question that life can be hugely unpredictable, which is why you must be totally prepared for any kind of survival or disaster situations where you find yourself on your own. Part of being prepared means having a fully stocked and complete survival kit ready to go to aid you in these kinds of emergency scenarios. Since an emergency situation can strike at literally any time, in order to protect yourself and keep your loved ones safe, you simply need to have a survival kit ready to go. This is the only way to ensure that you will be fully equipped and ready to go. In this article, we will cover a list of items that belongs in any survival kit or bug out bag, and then also discuss some pre-made survival kits already on the market so you’ll be all set and ready to go. 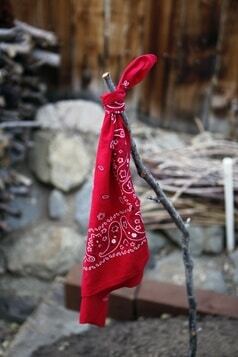 Here is a list of the basic items that your survival kit needs to have. If a pre-assembled kit you buy does not already have each of these items in it, then you will need to add it yourself. First and foremost is the knife. 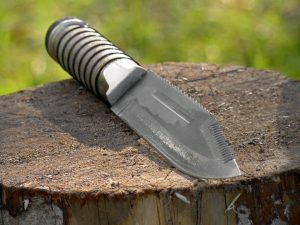 At minimum, your kit should have a fixed blade knife as well as a folding knife for a back-up or for more precise work. Your kit should have enough water in it to last you for a minimum of three days. That’s a reasonable amount of water that won’t be too heavy to carry over long distances while simultaneously being enough to sustain yourself over the short term. 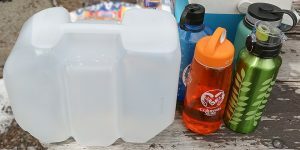 Keep your water stored in a metal water bottle as it is more durable than plastic and can also be used for boiling more water over a fire that you collect later. Additionally, you would be wise to also have water purification tablets and a water filter such as the LifeStraw. Shelter is designed to keep you shielded from the elements such as the wind and rain. Easily the best shelter item you can bring, though granted it is bulky and heavy, is a tarp. You can also use a tarp as a mattress, blanket, sleeping bag, a hammock, or as a rain catchment system. Shelter may keep you shielded from the elements, but it cannot necessarily keep you warm. Fire can. And that’s exactly why you need to have proper fire starting devices in your survival kit without question, including matches, lighters, and magnesium flint strikers. Your fire starters should enable you to get a fire going quickly even when it’s wet and raining outside. 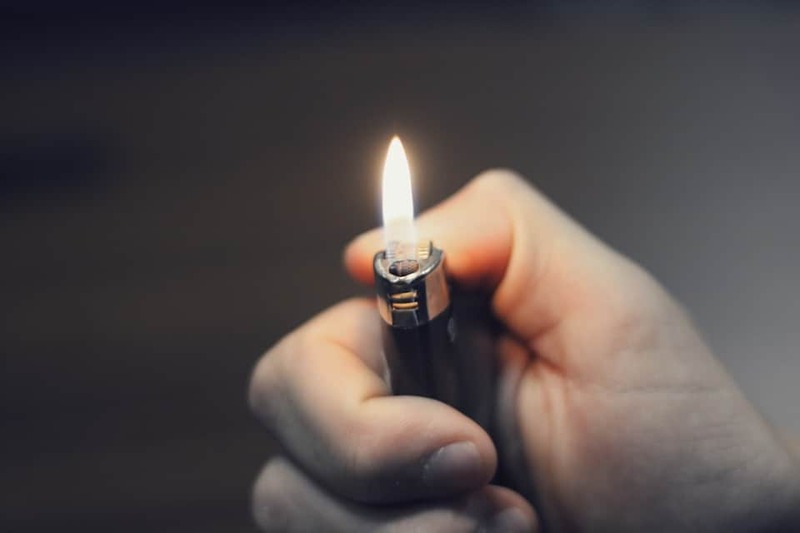 One way to ensure that you are able to isn’t just to carry a reliable fire starting device itself, but also to have something that is highly flammable, such as Q-tips or cotton balls soaked in petroleum jelly. 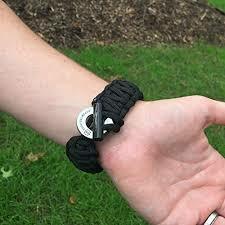 550 paracord will be the best type of cordage to have in your survival kit, because it’s strong and yet not bulky or heavy. Most survival kits already come with a compass, but you’ll want to make sure it’s high quality. You’ll also want to add a map of your surrounding area (preferably laminated so it holds up better), as well as a GPS/radio device with added batteries. This is definitely something that you’ll need to add to your survival kit on your own. At the very minimum, you’ll need a warm hat, an extra dry set of socks (to prevent trench foot), and a jacket or coat of some kind. The ability to see the environment around you in complete darkness will be a major plus in any survival situation. You may need to travel at night or explore the interior of a cave for a potential shelter. Be sure to have spare batteries too. Whenever you are in a disaster and go for an extended period of time without food, you will want to get more food into you in order to replenish your expended energy. The 40-2 Urban Survival Bag comes with SOS food bars in order to ensure that you remain properly fed and energized throughout a disaster. 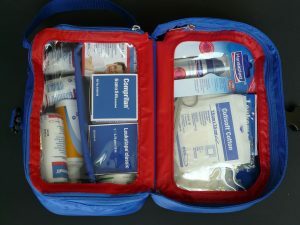 It also comes with a basic first aid kit that will enable you to properly treat minor injuries such a cuts and scrapes. A major plus to this survival kit is the fact that it keeps personal hygiene in mind, a subject that many survivalists and survival kit overlook, but not this one. Specifically, this kit comes with a soap boar, sanitation pads, a comb, toothpaste, and a toothbrush. 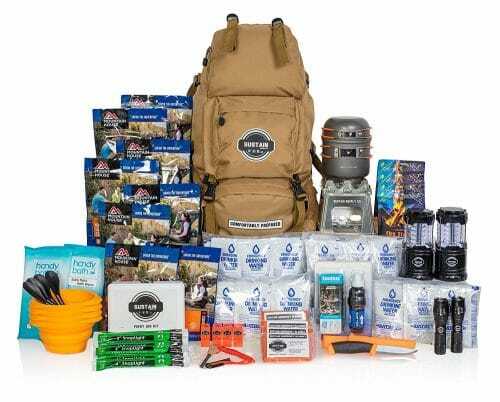 As the finishing touch, this kit comes in a high quality bug out bag that has yet even more room for you to add more items such as the ones that we listed above. Many survival kits are shipped with plastic bins or containers, forcing you to have to go buy a separate bug out bag on your own. The fact that this kit ships with a bag is not only more convenient, it will help to save you on money too. The CHANGKU Emergency Survival Kit contains eleven separate items designed to keep you alive in any situation, and it ships in a fully waterproof case that is fully indestructible as well, which is a nice feature. One such item that this kit ships with is an emergency blanket, which is designed to contain up to 90% of your body heat to help you sleep warm and soundly on chilly nights. 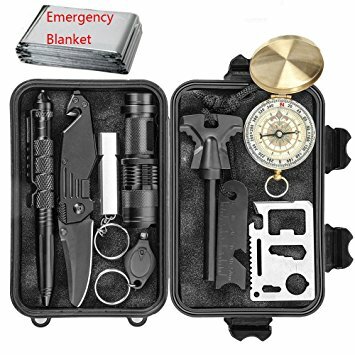 This kit also comes with a bright flashlight designed to illuminate the area around you, as well as a military-grade tactical knife with a bottle opener on the end. Additional item that this kit comes with a compass, a glass break, and a seatbelt cutter. All in all, while this may not be the most complete survival kit on the market, it does contain most of the basic items that you need for disaster and survival situations. Something that the previous two survival kits we have analyzed have in common is that they are primarily designed to be used by just one person. But the Mayday Deluxe 2 Person Kit, as the name suggests, is designed for two people in virtually any emergency. Not only does the kit ship in a completely waterproof container, it comes with food packs that each contain two thousand and four hundred calories, which is a significant amount of energy for a disaster. It also consists of twelve separate pouches of water, and light sticks that can also help to generate heat. The primary focus of this survival kit is on food and sustenance. To this end, it include twenty four separate food portions and 48 packets of water all in a backpack. It also ships with four separate whistles, two flashlights, and a portable stove to help you cook your meals while on the go. 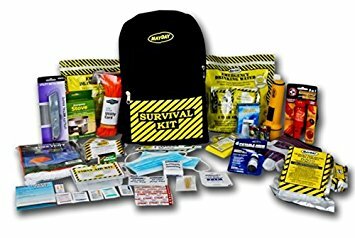 Additional supplies that this kit ships with include emergency blankets, a first aid kit, and tinder to make it quick and easy to get a fire going. 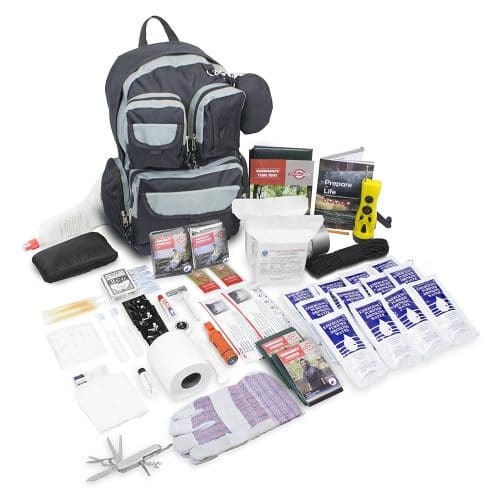 Like the Mayday Deluxe 2 Person Kit we looked at previously, the Ready America Emergency Survival Kit is also designed to have supplies for two people in an emergency, but specifically enough for a minimum of three days. Since bug out bags in particular are designed to keep you alive for at least three days, this is a huge plus. The main purpose to this kit is as follows: you’re in home when disaster strikes. The power gets shut off, the water gets shut off, and there’s a natural disaster of some kind outside. Now trapped in your home for the foreseeable short term future, this kit is what you and your spouse or partner would turn to in order to stay alive. It contains everything that the American Red Cross recommends, including food and water, emergency blankets, and food rations and drinking water with a rated shelf life of five years. In addition, this kit also ships with a thirty three piece first aid kit (also with items recommended by the American Red Cross), nitrile medical gloves, an emergency whistle, dust masks, tissues, and emergency ponchos. 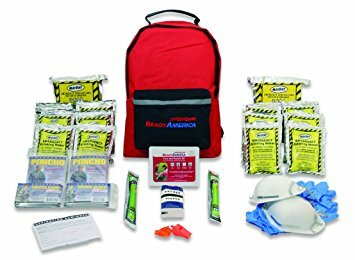 As the finishing touch, this kit has a Ready America red backpack that will allow you to take these items with you should you need to evacuate your home in a hurry. The simple fact of the matter is that emergencies happen literally all the time and you need to be ready for them. You can never be too sure of when a hurricane, earthquake, economic disaster, terrorist attack, or EMP attack will hit. So regardless of where you are, you need to have a survival kit ready to go so you are not entirely caught off guard. A pre-made survival kit offers you a convenient and relatively inexpensive way of having most of the items you need, but remember, there may be additional items that you need as well from the list that we outlined and discussed. Your best course of action would be to make a definitive list of all the survival items you need. Then, after buying one of these kits, cross off the items that are already in the kit. The remaining items that are not crossed off should then be the items that you would buy separately and add on your own.